How Important Is Cinema in French Society? Before you begin working your way to foreign language fluency, it helps to understand the culture behind the language you’re learning. After all, language exists to help a group of people express their ideas and beliefs. France is an old country with a rich history and culture. As you begin your French language program, gaining a strong grasp on this history, the values, and the etiquette will help you rapidly achieve success. In particular, the French have a great appreciation for high culture and fine arts. The French love of culture is the only thing that can compete with their love of food and drink. It is to them the sustenance of the soul, leaving no question about the quantity and quality of art and entertainment throughout the country. L’Officiel des Spectacles, a weekly guide in French, is the go-to source to find out what is happening in Paris. Opera lovers will delight in the constant offerings available not only in Paris, but in all metropolitan areas. Tickets are easily booked in advance through the Web. Keep an eye out for posters on walls and telephone kiosks, advertising local events that you might not find in other publication, especially if you are on the hunt for local live music. Museum are often closed on Mondays, so it is worth your while to check the guides and papers for opening hours. National museums are often closed on Tuesdays or Wednesdays, and they may list their last admission time as earlier in the day than you might expect. It is possible that larger museums stay open into the evenings one night a week. Permanent exhibitions of museums handled by the city of Paris are free, as are national museums on the first Sunday of the month. Otherwise, there is a fee, which can be quite high in the biggest museums. It is generally possible to buy a ticket that allows you admission to a number of additional local museums and sights. The value of this ticket is that it gives you immediate access, avoiding lines. If you plan on visiting more than one site, look into a pass that might cover all of them, as these will save you significant amounts of money. “Les Grands Spectacles” (great events) fall into three main categories in France: concerts, galas, and displays. The grand spectacle is an event of major importance to French culture and, as such, is prominently promoted throughout the city that may be hosting it. Posters can be seen in most store fronts and ads will promote the event in all of the area newspapers. Businesses are happy to help promote it out of their love for performing arts, as well as for the extra business the event is sure to draw to the city. The events offer performances from French or American celebrities. Each event is different. They may consist of outdoor music festivals or concerts, live sporting events, or dance performances. Jazz is one of the most beloved forms of artistic expression in France. Dance performances featuring jazz music draw the best crowds throughout the country. In the south of France, Antibes hosts an annual jazz festival that draws a big crowd. The event is anticipated every year for its exploration of jazz music, but also for the exotic and exciting atmosphere offered by Antibes’ spectacular views. The French also love their “sorties au théâtre” (“going out to theater), particularly those events that draw on the country’s love for classic theater. One of the most popular attractions is the Comédie Française, which is hosted in Paris. The show treats theater audiences to live performances of the greatest works from classic playwrights. Among the most celebrated performances, the plays of Corneille, Racine, and Molière are brought to vibrant life. The stage performances entice audiences with traditional stories acted out by contemporary artists. Cinema isn’t that old, when compared to other forms of art. The filmmaking industry was born in France no more than one hundred years ago, but it has flourished greatly in that short span of time. Today, the United States and Japan lead the world in cinema, but France trails closely behind at number 3 in terms of box office sales and gross profits. The French government does what it can to promote its own filmmaking industry, so that may have something to do with the country’s cinematic success. The French government promotes its cinematic community by requiring that a predetermined number of films must be made by French production companies and must have dialogue spoken in the French language. The same restrictions apply to music production, ensuring foreign products won’t dominate the French market. Additionally, France imposes a four-month waiting period before any film can be released on DVD or Bluray disc. This ensures every film has the opportunity to take full advantage of its box office release, before DVD sales and rentals impact theater ticket sales. As a nation of film aficionados, France takes motion picture production very seriously. This may be why there are so many well-respected film festivals hosted by the country each year. 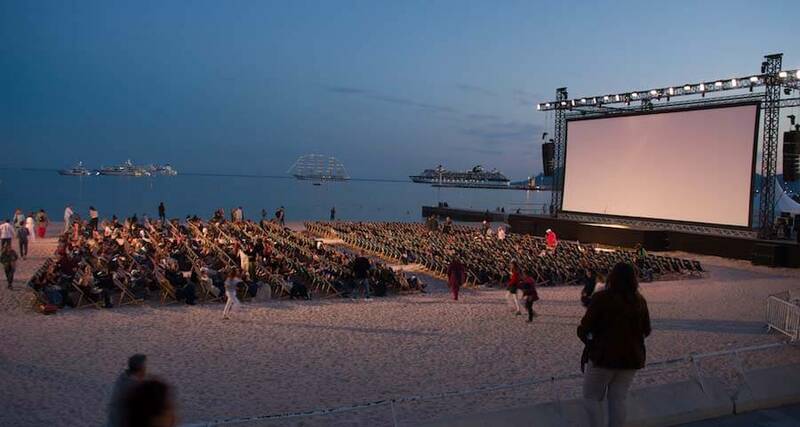 The most popular festival is Cannes Film Festival, which draws international attention and carries a reputation for promoting only the best in modern filmmaking. Outside of France, films from French directors and producers attract world recognition and appreciation. The Artist, a 2011 French silent film, is one such example. Though filmed in French, the film has been dubbed in English to appeal to international audiences, and went on to win the Academy awards for Best Picture (the first French film to do so), Director, and Actor.